The schedule of Cincinnati art classes at Mt. Washington Artworks in Anderson township for 2019. We offer art classes for kids in Cincinnati, Ohio -- real art lessons taught by experienced teachers and professional artists. Our unique method of instruction and individual attention has produces a very successful art course and a very enjoyable time as well. If you miss a week of art classes for any reason, we let you make it up. All art supplies and materials are included in the tuition, so you never have to buy anything. 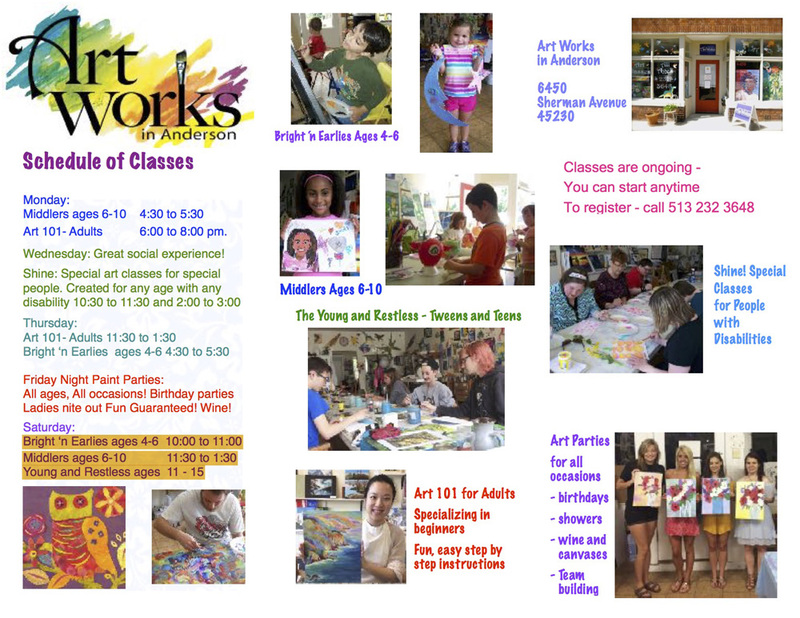 These classes are not just for the gifted and talented, but for anyone who enjoys making and exploring art. Your first class is always free. The art classes for kids offers safe mediums and fun projects, including story-telling and innovative art materials not normally found in a school environment. In addition to art classes for kids in Cincinnati, we offer a unique and fun opportunity for the beginner or the experienced artist to paint in a beautiful studio with water colors, acrylics, and pastels. Ongoing registration for art classes in Cincinnati! You can start anytime! And if you miss a week of art classes you can always make it up!